15 years ago, Pinnacle Design/Build Group, Inc. and Richard Goettle, Inc. of Cincinnati, OH, a leader in deep foundations and earth retention systems, started the Pinnacle-Goettle Alliance partnering together to provide earth retention systems on key projects across the United States. This strategic alliance allows two innovative construction companies to combine their talents, assets, and more than 80 years of combined experience to tackle the toughest earth retention challenges a project can offer. “Top-Down” or “Bottom-Up” retaining walls can now be delivered from a single source design/build provider. This delivery method has provided our clients with quick delivery of efficient integrated designs that shorten the overall construction time.In 2015 the Pinnacle-Goettle Alliance successfully completed several key projects that confirm the strength of the alliance’s capabilities. To support a new rail line expansion, a $2.65 million 42 ft tall permanent combination retaining wall consisting of a soldier pile retaining wall and a MSE panel retaining wall was constructed in 7 weeks in winter conditions. Mississippi State University Classroom – Starkville, Mississippi. As part of the construction of a new classroom building, the alliance provided a $1.5 million value engineered permanent anchored soldier pile retaining wall with a concrete segmental block facing. Rockies Express Pipeline (REX) Facility – Powhatan, Ohio. In order to construct a new compressor station, a $500,000 permanent anchored soldier pile with precast lagging earth retention system was constructed to support a communication tower that was critical to the energy pipeline networks. 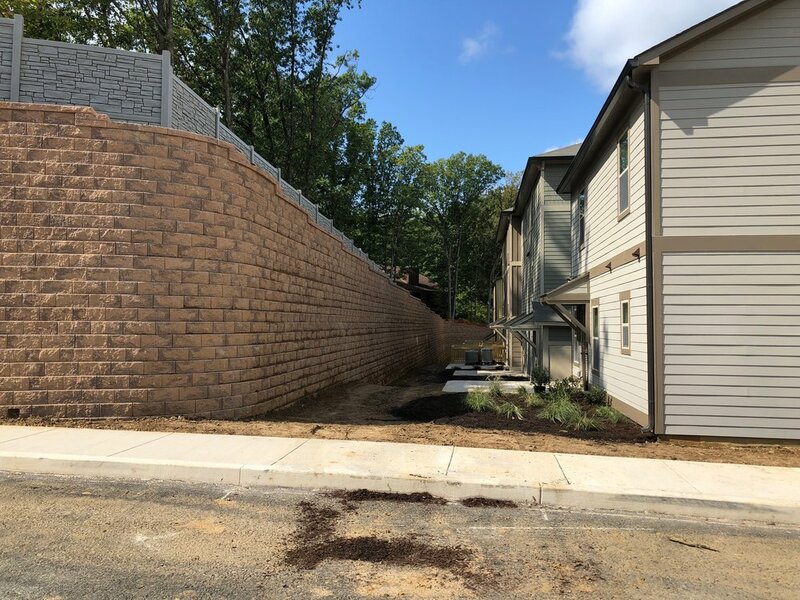 As part of the construction of a new collegiate housing facility, a closely spaced cantilevered soldier pile retaining wall with reinforced shotcrete lagging was constructed to support an excavation cut along the property’s boundary. A segmental block wall was then mechanically attached to the shotcrete face to provide a uniform aesthetic throughout the site walls. A new natural gas compressor station required extensive rock excavation through partially weathered claystone and shale in order to reach the foundation pad elevation. 600 rock nails & 2,500 square yards of rock fall protection netting were installed to catch any unstable, loose rocks from the excavated slope. A new compressor station along a natural gas pipeline required a retaining wall system that protected compressor equipment and personnel from potential landslides. More than 12,000 square of feet of anchored soldier piles were installed as the retaining wall solution. A new compressor station along a natural gas pipeline required a solution for erosion and sediment control in order to support a compressor pad, 2 meter pads, a pig trap pad, an industrial spoil area, and topsoil spoil areas. 3,000 square feet of a soldier pile and precast concrete lagging were installed to support the development.